President Donald Trump dances with Navy Petty Officer 2nd Class Catherine Cartmell, from front left, first lady Melania Trump dances with Army Staff Sgt. Jose A. Medina, Vice President Mike Pence dances with Air Force Master Sgt. Tiffany Bradbury, and Karen Pence dances with Marine Sgt. Angel Rodriquez at The Salute To Our Armed Services Inaugural Ball in Washington, Friday, Jan. 20, 2017. In the background family members dance. President Donald Trump's inaugural committee is facing a new legal threat after the attorney general for Washington, D.C., issued a subpoena for documents, NBC News reported, citing a committee spokesperson and source familiar with the matter. 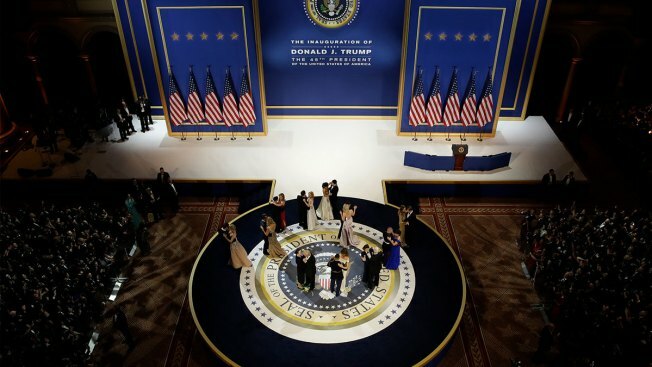 The legal action marks the third known government agency scrutinizing the finances of the inaugural committee after it raised and spent a record-breaking $107 million. The revelation of the new investigation, which was first reported by The New York Times, comes three weeks after the U.S. attorney's office in the Southern District of New York subpoenaed the committee. The New Jersey attorney general is also probing how it spent the massive haul of cash.